Mladen Stilinović: Ruka kruha 1976. Vrlo rijetko u ponudi. Katalog za prvu samostalnu izložbu Mladena Stilinovića - Ruka kruha, Galerija Nova, Zagreb 1976. godine. Uključuje i pozivnicu za izložbu, vlastoručno adresiranu od M.S. za M.B. Predgovor Nena Baljković. Design Mladen Galić. Pan 69. Okupljanje grupe kod Mladena Stilinovića Original fotografija. Autor fotografije Mišo Budisavljević, jedan od nagrađenih autora na Geff '69 Zagreb, 1969. Sitotisak / Silkscreen 50x70cm Pan 69. Mladen Stilinović: "Together with Milivoj Puhovski, Degenek and Boris Bata we formed the student film club Pan 69. Through the Union of Socialist Youth we received some funds to buy the necessary equipment and start making films. At first Pan 69 had six or seven members. The first film produced by Pan was Miša Budisavljević's film in 1969, which was screened at GEFF. Pan 69 held film screenings in Zagreb and Belgrade: at the Zagreb Cinema Club Pan 69 had regular nights, as it did in Belgrade at the SKC (Students Cultural Center)." 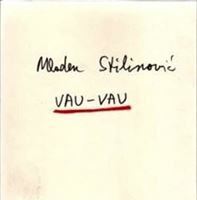 (from Ana Janevski's interview with Mladen Stilinović, unpublished) At the beginning, like many young people, Stilinović wrote poetry, and published some of it in the literary journal Republika. But since his interests were more in the direction of film, with his friends in 1969 he founded the group Pan 69, which was a student cinema club. In order to get hold of film stock and the equipment necessary for making films, this was the only way at that time. Some of the first films were shown at amateur film festivals, but they were fairly different from the production that could be seen there, and so he was invited to places more adapted to his idiom, where the focus was on contemporary visual art. (Branka Stipančić) In 1969 a group of friends – Boris Barta, Mišo Budisavljević, Branko Degenek, Ninoslav Lovčević, Krsto Mihaljević, Milivoj Puhlovski and Mladen Stilinović – founded the student cinema club Pan 69. He shot his first films Ostani na uglu (Stay on the Corner) and Sam si (You’re Alone) in 1970. That year, in a disco club, he met a high school student, Branka Stipančić, (the author of this text) and the two started a long-term relationship. With Pan 69 and his friends he performed the one and only happening entitled Majski i ostali rituali (May and Other Rituals) in Zagreb, in the Theatre ITD during the 24th May Festival of Yugoslav Student Theatre. The happening was stopped and censured while in progress due to political reasons. He also watched American underground films at Zagreb Genre Film Festival (1970), and admired films by Gotovac, Pansini, Petek, Kristl, Vukotić, Makavejev, Pavlović, Žilnik, Naško Križnar, Nuša and Srečo Dragan… He always visited exhibitions of the New Tendencies as well as those held at the Gallery of Contemporary Art. He was motivated by numerous events and translations of critical editions about film, historical avant-gardes, happening, conceptual art, philosophy of language and linguistic theories, which were available in former Yugoslavia in numerous journals such as Rok, Polja, Treći program, Delo, Filmske sveske, Književnost, in the book Mixed Media by Bora Ćosić, etc. He knew well the domestic art scene: the Slovene group OHO, works by Zagreb artists such as Goran Trbuljak, Sanja Iveković, Dalibor Martinis, Braco Dimitrijević and others, and their interventions in urban space. 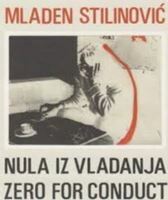 During Pan’s Days, held on a small stage of the Student Centre in Zagreb in 1971, Stilinović showed his films Panika (Panic), Ja volim ljude, a vi? (I Love People, How about You? ), More i … (The Sea and …), and Ramenim tako bolno ceo smešan svet (Painfully Shouldering the Whole Funny World), all shot in the same year, and participated in the 6th Festival of Croatian Amateur Film in Zagreb. Artist's Book. Dizajn Mladen Stilinović i Dejan Kršić. Izdanje Galerija Nova, Zagreb 2006. godine. Knjiga umjetnika povodom izložbe Vau - Vau (Wuff - Wuff). Tisak GIPA Zagreb. Tekst Ana Dević WHW. Stanje - kao novo. Katalog za izložbu Mladena Stilinović - Bijela odsutnost 1991-1996. Galerija Josip Račić, Zagreb 1996. godine. Predgovor na engleskom i hrvatskom jeziku Mladenka Šolman. Fotografije Boris Cvjetanović. Catalogue design Ante Rašić / Arttresor Studio.